Hundreds of course graduates will tell you that the 5 Day RV Maintenance Tech Course was "One of the best training investments they have ever made!" That sounds good but what if you can’t make it to one of the live sessions this year? What if you could still experience this RV Maintenance Course right on your computer from the comfort of your own home? 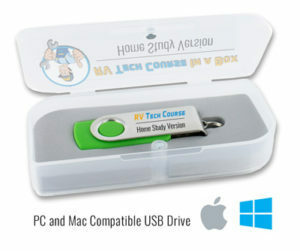 What if you had all the training information online or on a USB memory stick along with all the handouts just like those used in the live classes? Now you can have it all..
Home the Home Study Version of the RV Maintenance Training Course! Get the RV Maintenance Home Study Course with Master Certified RV Technician and Professional Instructor, Terry Cooper, “The Texas RV Professor” and learn how you can maintain and repair your RV at your own pace and the most convenient time for you! Field training exercises so you can have the “hands on” learning experience too! 80% of the problems we have with our RVs are Easy to Access and Easy to Fix...if someone will just show us how. Work toward becoming an RV technician so you can work at a dealership or launch out in your own business as a Mobile RV Technician. Work towards becoming an RV Inspector that can do "home inspections" on RVs and help RV buyers make a more knowledgeable purchasing decision. With the Home Study Version of the RV Maintenance Training Course! You will receive a Bonus Training Credit in the amount of $300. This credit is valid through the end of 2019 and can be applied towards tuition of one of the 5 Day Hands On RV Maintenance Course dates or any of the Advanced RV Dealer Training Classes (appliances and exterior) being offered at the National RV Training Academy. Because a small portion of the course is aimed at introducing you to the idea of having your own business (as an RV Inspector for example), Workamper News is offering a bonus one year Workamper Gold Green membership! Inside the member's area of Workamper.com, you will find the "Small Biz RVer School" - this supplemental, informational course will get you primed for learning more about the benefits of owning your own small business that you take with you on the road in your RV. This $47.00 value is yours for free with your purchase. Workamper News will get your account setup after you register for this home study option and if you are already a Workamper News member, your membership expiration will be extended! You don’t have to build your small business alone when you can learn from others who have come before you and take a proven model and make it your own. Take advantage of this bonus to develop and build your very own small business. Register today and take your first step in building your future wealth. The National RV Inspectors Association (NRVIA) awards certification for RV inspectors along with providing education and resources to help you develop a successful RV inspection business. Get started with the NRVIA for $200 off the normal membership cost! If the idea of doing RV inspections intrigues you, this bonus makes it more affordable to start down this path! Take action today and get started learning with the RV Tech Course Home Study Version! Learn how your RV operates from the comfort of your home and at your own pace! Order the RV Tech Course Home Study Version today for $397 and receive the course material in an online classroom or by mail with all the videos, the workbooks and hands-on exercises - shipped Priority Mail right to your doorstep! *Free Priority Mail shipping inside continental US. $40 to ship outside of the US.